I have not been doing much GameDev this year, but it’s time to get back on that horse. This will be my 8th Ludum Dare (5th solo). I am terrible at Animation anyway, and now I am having issues getting models from Qubicle -> Blender, so I shall just design to avoid Animation this time. For LD32 I submitted Magnets, How Do They Work? Overall I was not particularly happy with my submission, but I think the core concept and mechanic work as a game. 2) No planning and early mistakes snowballed. I had an issue with physics/controls/collision detection early on which, instead of spending the time to do properly, I just worked around. Eventually this got too far and I had to make it so that colliding with the walls in the game meant game over, which almost every comment on the game mentioned was silly. And it was silly, I never meant it to be that way but it would have taken too much time to fix by the time I got around to it. 3) A bit of a mess. As with every Ludum Dare it was quite hectic and stressful. I didn’t keep my sleeping pattern, there was no sensible design or aim to my game and I didn’t take any time away from the computer for the weekend except to sleep. Without much direction my game went a bit odd design-wise and the level layout and design was poor. I think the core game mechanic has legs and would work in a better designed game. I’ve created a remake (below) which tries it out in a better setting and solves some of the problems my LD32 submission had. I wanted to try out the core mechanic in an environment that made a bit more sense. The remake is buggy as all hell but it looks better and you can touch the walls without it being game over. 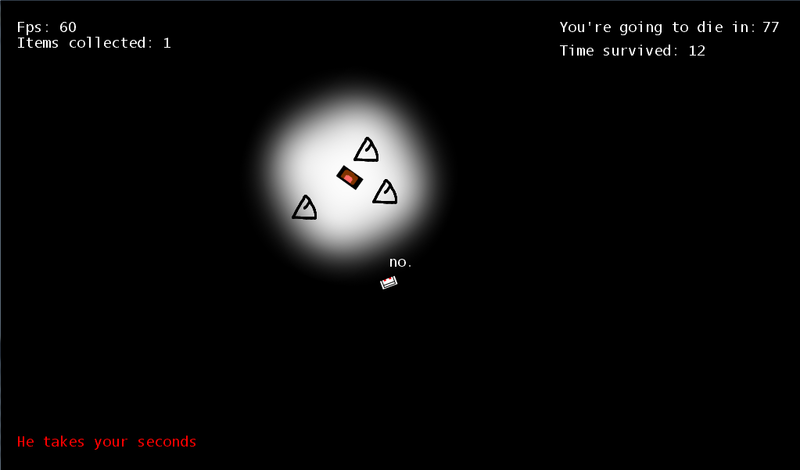 But as I said, it’s quite buggy and is by no means a finished game. Myself and Alex will be participating in the jam again, probably on something less bee related. We’ll be mostly using the same stuff as before but instead of standard 3D PlayCanvas like last time, we will use a 2D engine type thing for use with PlayCanvas that I have been working on. There’s hardly anything there and it’s very rough, but will hopefully be enough to make a game. Currently adding music and bee attacks. Then wasp AI to come soon after. Though not my first Ludum Dare, this is my first ‘I’m in’ post and first time participating in the Jam and collaborating. Even though I lost most of yesterday and will lose a lot of tonight too, it looks like I will still make it to the 48 hour and not have to venture into Game Jam 72 hour territory. Using PlayCanvas to make this. Currently running on cups of tea, jaffa cakes and Everything Everything music. But I think I might be done. I currently can’t think of anything else to add, and I’m tired as balls.